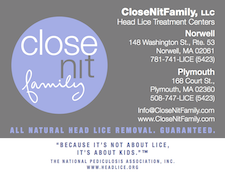 The chart below is a comprehensive list of Massachusetts lice removal professional services. Some of these businesses are actually treatment centers for head lice, which are sort of like hair salons. Children watch DVDs while the professionals comb lice and nits from their hair. Other companies travel directly to private homes in order to treat and remove head lice. Please contact these businesses directly for further information. There are several services to choose from if you live near Boston. Read the page on this site regarding how to choose among lice removal services. Know of another lice business that should be on this page, but isn't listed yet? Please fill out the form below and let us know about it. We strive to keep our listings complete, and we'll update the database right away with your information!